How do we get ship’s position by star sight ? 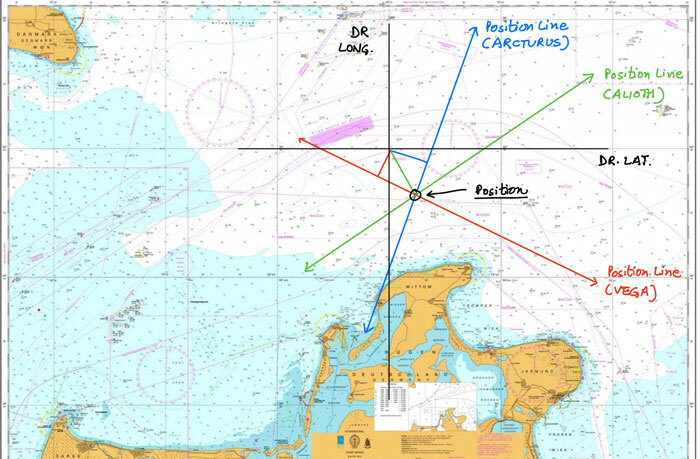 These days, there is an enormous amount of information available on celestial navigation. Which means there is also a lot of noise to sift through. How do you apply all of this knowledge practically on board the ship. Talking specifically about star sight, there are tons of resources that deals with the calculation part. 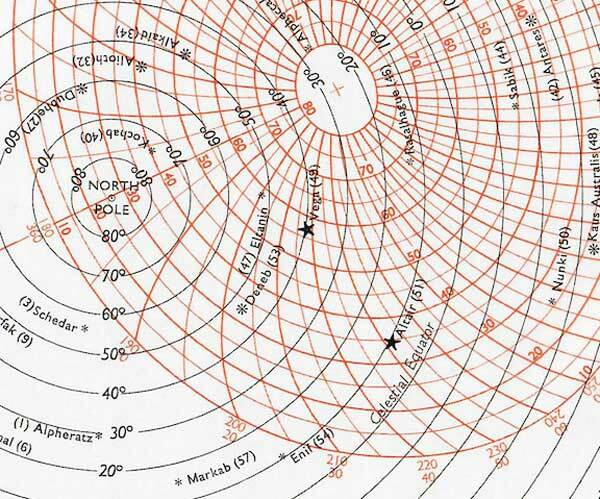 Be it Longitude by chronometer or intercept method calculations. Most of us know all these calculations but only that much. But how can we use these to calculate the sight ? In this post, I will show you step wise procedure to use the star sight to calculate your position on board. 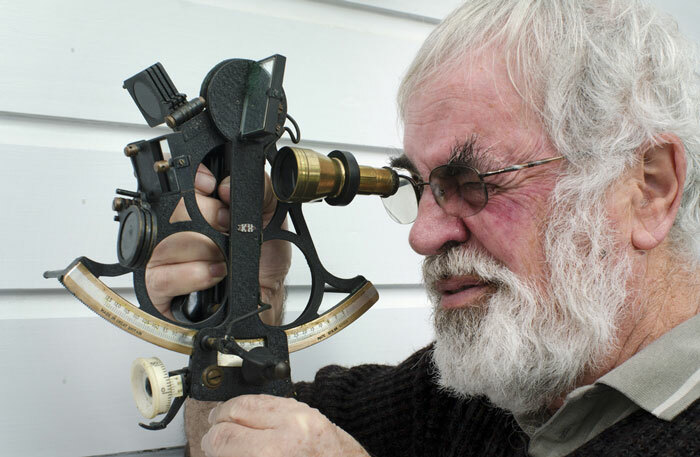 I have covered the basics of the celestial navigation in a different article. You can read this article by clicking on here. And if you have read it you would know that celestial navigation is based on calculation of zenith distance and azimuth of the celestial body. 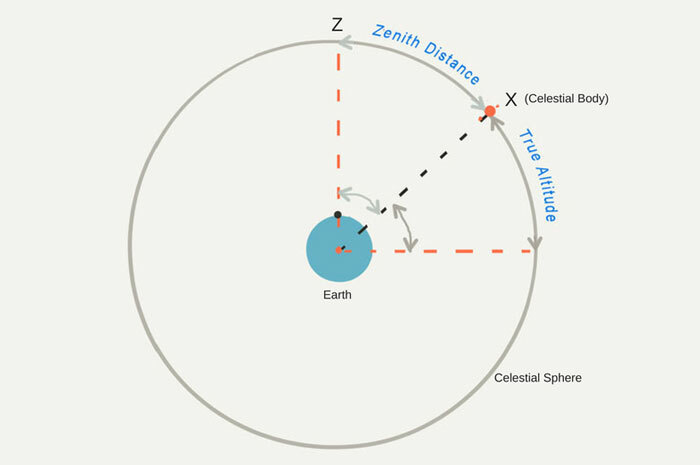 Zenith distance and altitude of the celestial body are inter-related. Here is the relation. 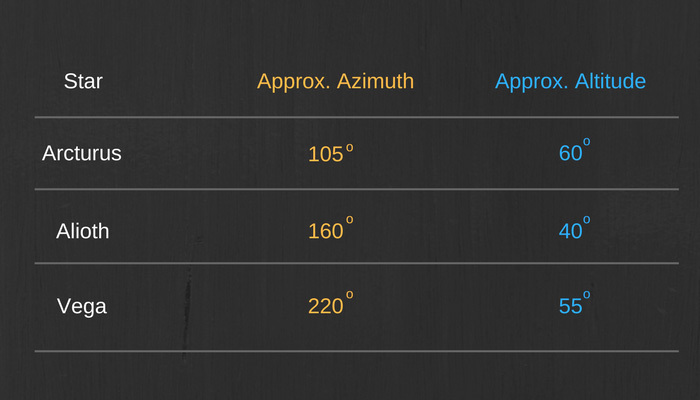 Zenith distance + True Altitude = 90 Degrees. All we want is True altitude of the celestial body which can be calculated by measuring the altitude of the celestial body by a sextant and applying few corrections to the measured altitude by sextant. I won’t go more deep into the calculations part. I assume you already know that. Sextant altitude is measured by bringing the celestial body on the user’s visible horizon and reading the altitude from the sextant. 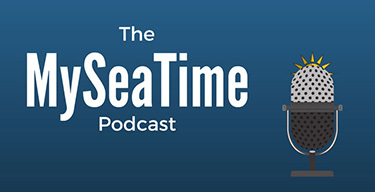 Here is a video that explains the use of sextant. So far so good. For measuring the sextant altitude two things should be visible. But the issue with the star sight is that, stars are visible at night and horizon is visible when there is daylight. Or, when the horizon is clearly visible, there aren’t any stars in the sky and when the stars are visible, the horizon isn’t visible. Then how do we measure the sextant altitude of the stars? Nautical twilight is the time when some stars may be visible and during the hours of twilight there is still some daylight that horizon is visible too. 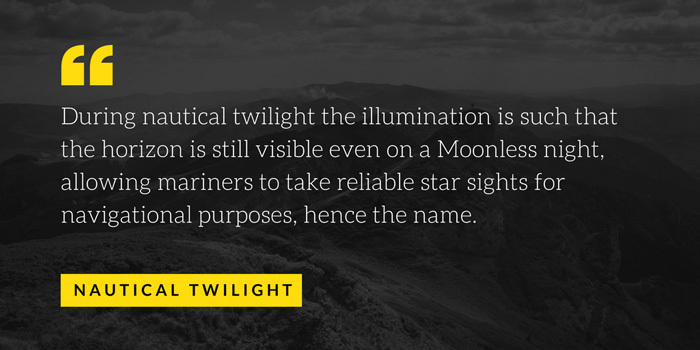 The name “Nautical twilight” is given because this is the time when mariners can see both the horizon and stars and is ideal for the star sight. 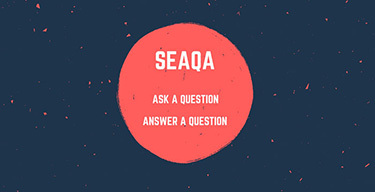 But how to know the time for the Nautical twilight? The twilight time is given in the nautical almanac. In the morning, the period from complete darkness to the sunrise is divided into three twilights. We are interested in the period of Nautical twilight. 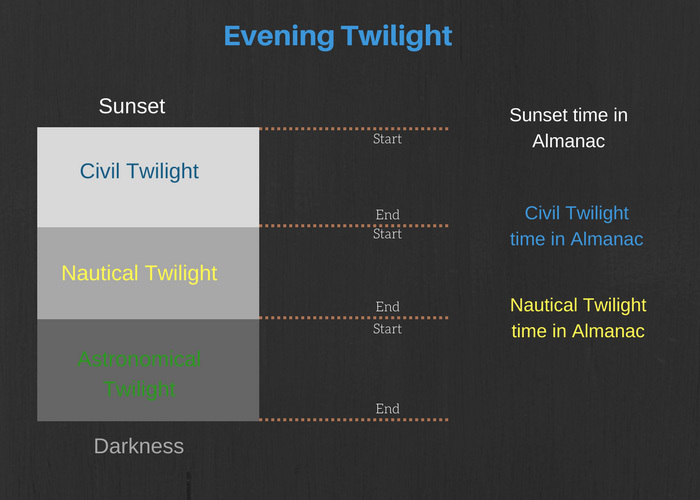 With respect to times mentioned in the nautical almanac, this would be the period between the time of “nautical twilight” and “Civil twilight”. 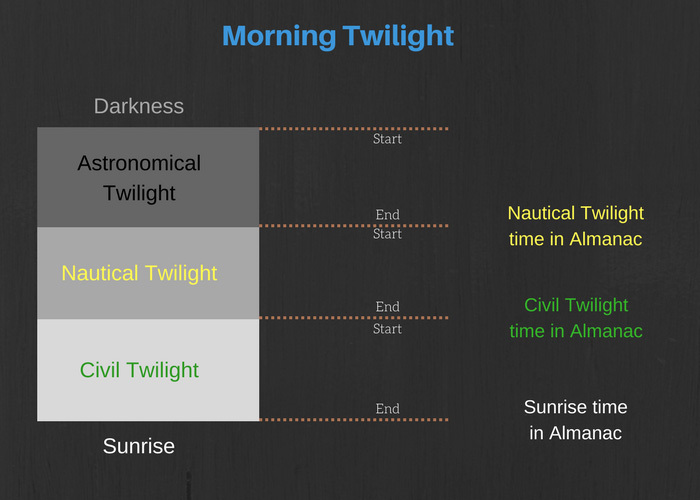 So for morning star sights, we need to calculate the nautical twilight time from the almanac. That would be the time we need to start looking for the visible stars. For the evening twilight, here is how the period from sunset to complete darkness is divided. So for evening twilight, can you guess what time you should start looking for the stars for star sight? Or in other words, what is the time for start of nautical twilight? Yes, you got it right !!! 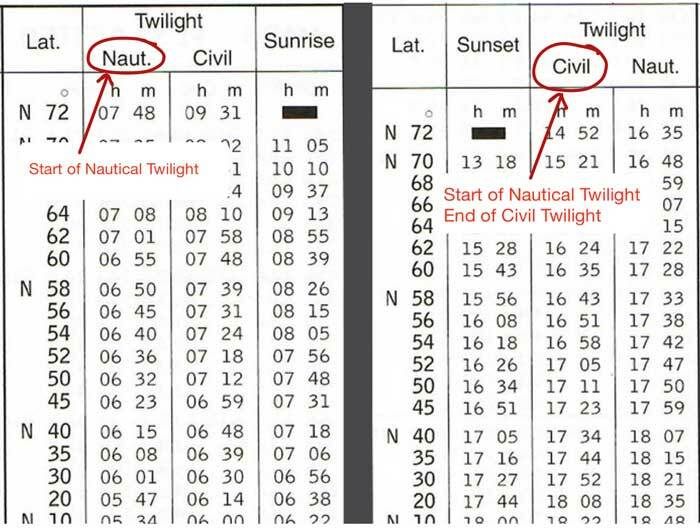 Civil twilight time mentioned in the almanac is the time of “end of civil twilight” and “start of the nautical twilight”. For evening star sights, this is the time we would be interested in. The twilight time given in the Almanac are LMT. This need to be converted to the ship’s time so that we know at what time (ship’s time) will be nautical twilight. 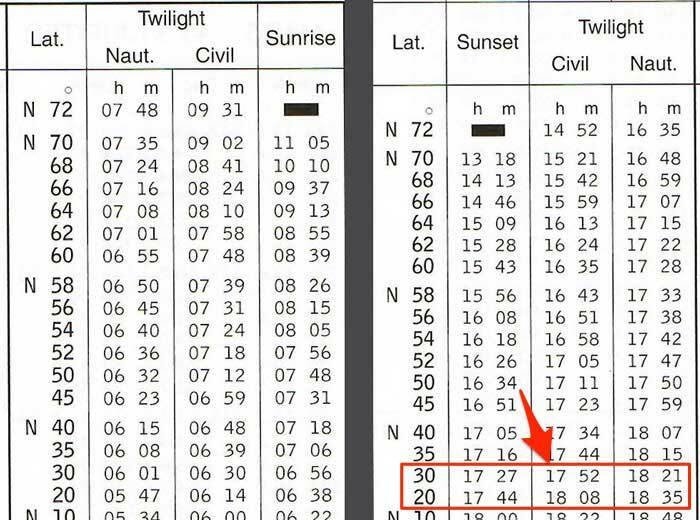 From the Nautical Almanac, get the time of evening civil twilight (start of Nautical twilight) for 25 degrees North. 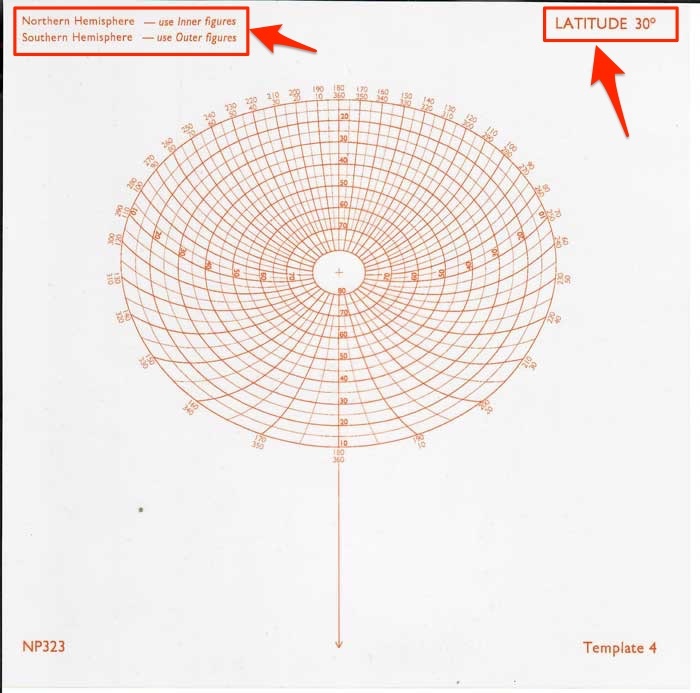 You will need to interpolate as the times are for 20 degrees North and 30 degrees north. Here is the calculation to calculate civil twilight time as per the ship’s time. 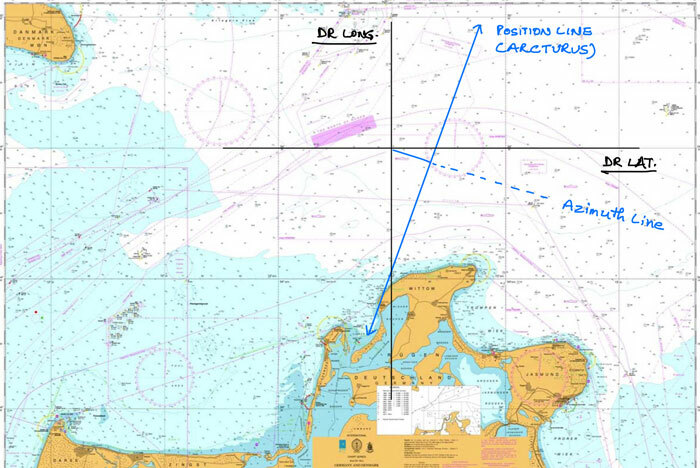 So in this case we need to be ready with the sextant at 1720 Hrs ship’s time (1320 Hrs GMT) looking for the stars. If you see the time period of the nautical twilight (start and end of nautical twilight) from the nautical almanac, you would note it to be less than 30 minutes in most cases. Ideally we would have around 10 minutes of the times to take the sextant altitude of the stars. If we don’t know where to look for in the sky, or which star we are planning to measure the sextant altitude for, we will never be able to take the star sight. In other words, period of nautical twilight is never enough to look for the stars, identify the star and measure it’s sextant altitude. Remember that we need identify at least three stars separated perfectly from each other (close to 120 degrees difference in azimuth) for a perfect star sight. This is where star finder (NP 323) is used to find this information. NP 323 (Star finder) consists of one sheet for the layout of the stars. This sheet has two sides, one for Northern hemisphere and other side for southern hemisphere. It also consists of transparent templates for different latitudes of the observer. The instructions for use of star finder are clearly given on the star finder sheet. In a nutshell, here is what we need to do. Calculate the LHA Aries for the time of observation. As we discussed we need to take the star sight at start of Nautical twilight. For evening sights this is Civil twilight time in the Almanac. Choose the transparent template nearest to the DR latitude. So if our DR latitude is 27 degrees, we need to choose 30 degrees template. We need to place the transparent template on the star finder sheet as per the instructions above. The stars inside the web of lines are the stars that would be visible to you at the time of nautical twilight. Now we need to choose the best 3 stars among these stars. Let me explain these two points. The brightness of the stars is denoted by different symbols of the stars in the star finder. All these stars are visible to the human eye but considering that there isn’t complete darkness during twilight, we must try to choose the stars with magnitude 2.0 or less (preferably with magnitude less than 1.0). Apart from brightness of the stars, we also need to take into account the azimuth of the stars. We do not want to select stars with azimuth line parallel to the other selected stars. This is because then the position lines that we will get from the star sight will be close to parallel to each other. And that is not good for getting the position of the ship. For example, in the below configuration star Vega and star Altair both are bright stars but we cannot choose both of these. 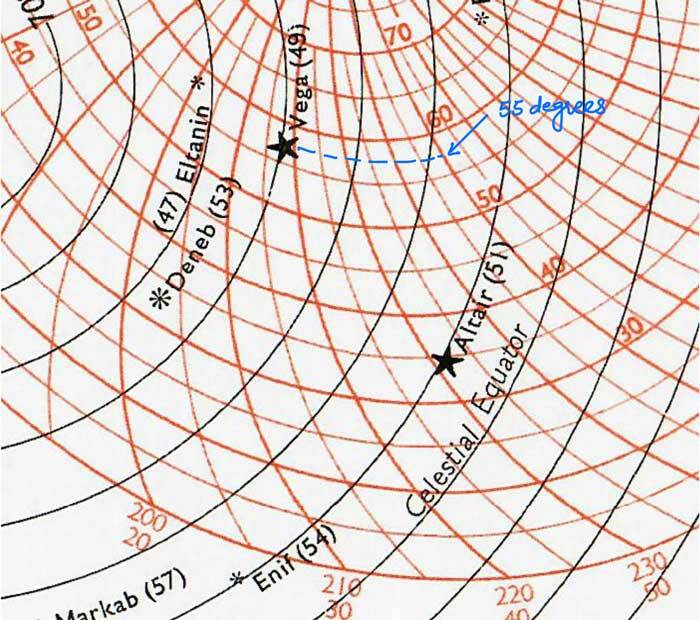 This is because the azimuth of the Vega is 220 degrees and azimuth of Altair is 230 degrees. Both of these stars are separated by only 10 degrees. If we choose these two stars the position lines that we will get from these stars will be separted by only 10 degrees. 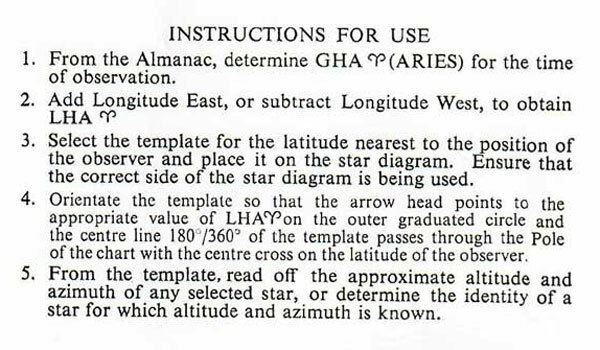 Apart from azimuth, we also need to note down the approx altitude of the selected star. For example in below picture, the approx altitude of Vega is 55 degrees. 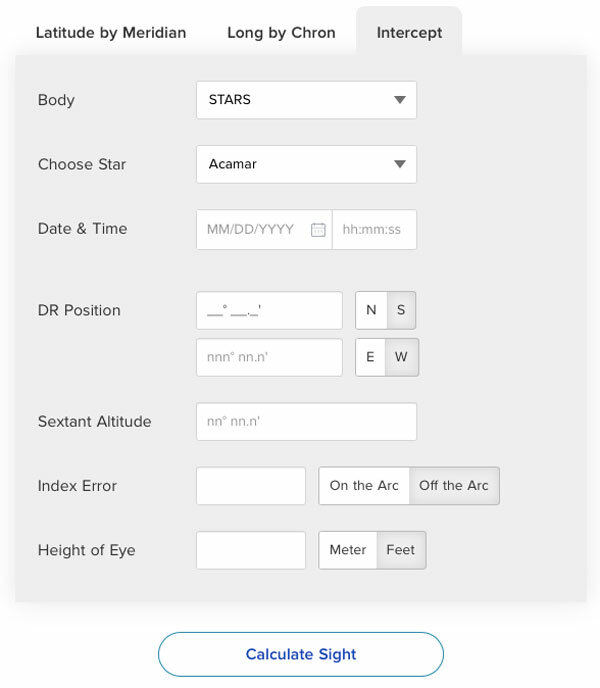 So with the help of star finder (NP 323), we will be able to choose three stars that we need for star sight. 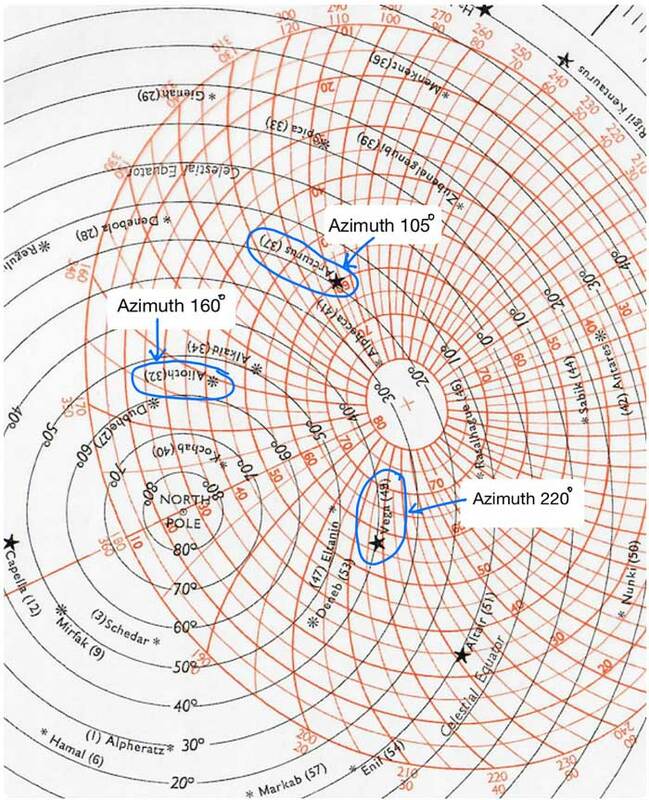 Also we will have the approx azimuth and altitude of these stars. Now we know the stars we need to star sight and its location in the sky. So when the nautical twilight starts, be ready with the sextant to measure the altitude of the selected stars as these become visible. Keep on looking in the direction the azimuth of the selected star. For example from the bridge wing gyro repeater, look where is 105 degrees. The star Arcturus will be visible in this direction. But then the question is, how high in the sky to look for this star ? You can get this information by measuring the sky with your fist. 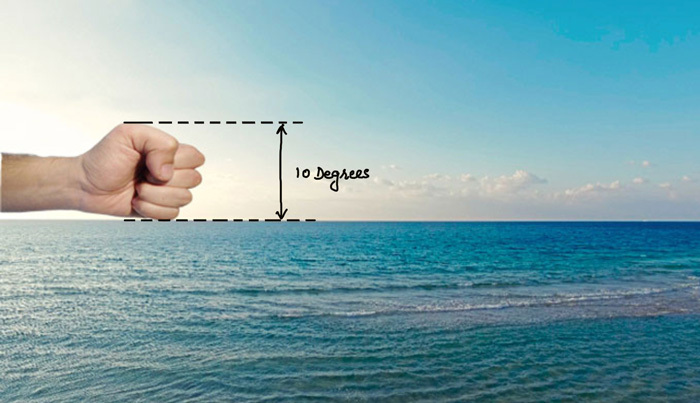 Height of one fist is equal to 10 degrees of altitude. So for star Arcturus (approx altitude 60 degrees), start from the horizon (in the direction of 105 degrees bearing) and measure height of 6 fist. This is where this star would appear. Do same for other two stars and get to know the approximate position where you would expect the star to appear. Now keep on looking closely in these three locations in the sky and measure the sextant altitude of the star as soon as the star appear. Before you get ready for measuring the sextant altitude, get to know the “Index error” of the sextant. (I am not eleborating on the sextant errors in this post). Now as you see your selected stars in the sky, measure its altitude by sextant. Do not forget to note down the exact time of measuring the sextant altitude. 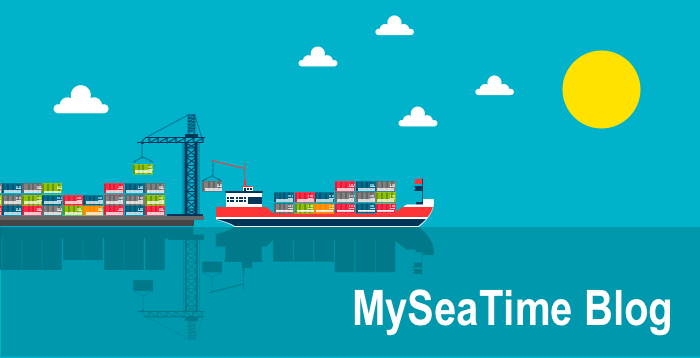 Inaccuracy in noting down the time can cause error in final position of the ship. For each observation, calculate the position line. 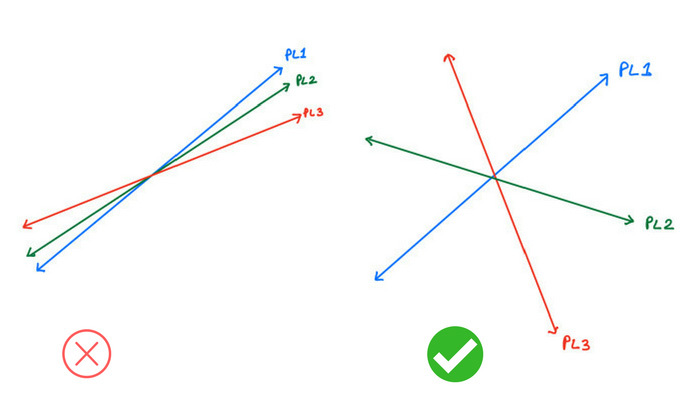 For star sights, intercept method is preferred for calculations. We already know the DR position of the ship. With these values we can plot the position line on the chart. We just need to know from where to draw this position line. 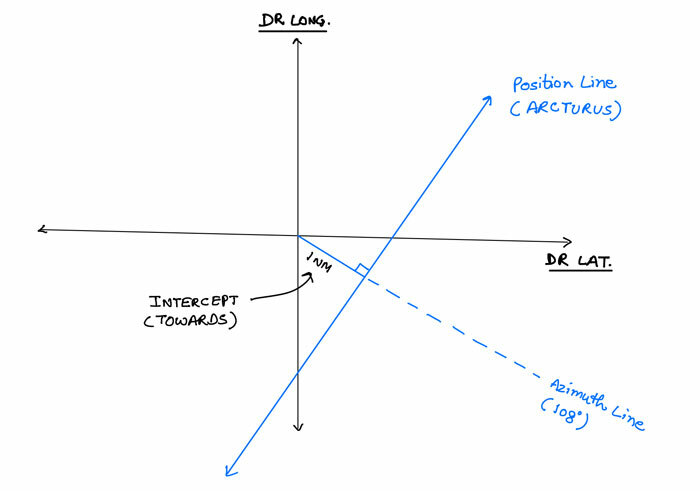 From the DR position we need to draw azimuth line and cut the intercept of 1 NM. If the intercept was 1.0 NM away we would need to draw the azimuth line in the opposite direction and cut 1NM mile on this line. The position line will be 90 degrees from the azimuth at the point of intercept that we cut. It would look something like this. This is how the position line looks in theory. 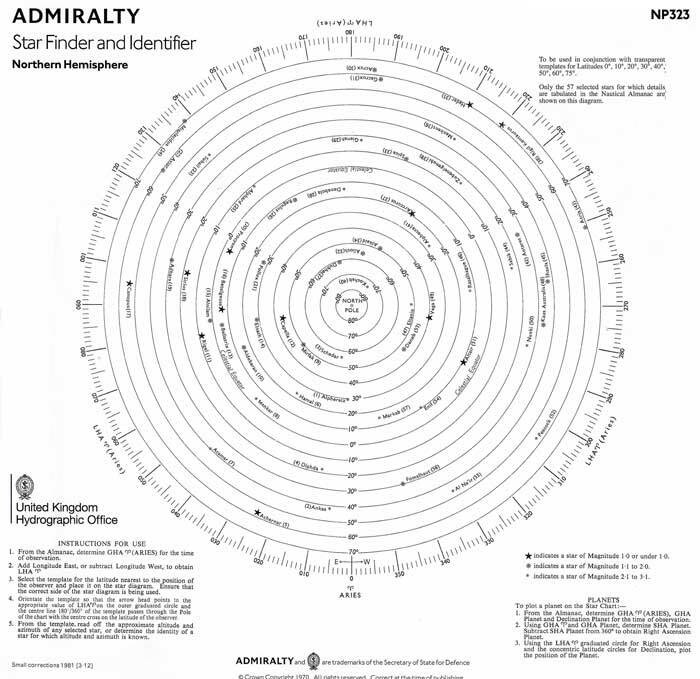 But in reality when taking star sights on board, we need to plot this on the chart with all the lines (azimuth, intercept etc) to the measurement. This is how we need to plot the position line on the chart. Similarly, we need to draw the position lines obstained from the celestial observation of other two stars on the chart. The position where all the three position lines would meet is the position of the ship obtained from the star sight. This is how this star sight plotted on the chart may look like. Just use the parallel ruler for reading the position you just obtained from the star sight. And congradulations !!! You are a true navigator now. What’s more, we have developed a sight calculator for you to easily calculate and understand the calculation part. Just input all the values and click on the “Calculate sight” and it will calculate the sight instantly. The irony with celestial navigation is that everyone teaches the easiest part which is the sight calculations. But how to use all those calculations practically on borad to get the ship’s position remains unanswered. With regard to star sight, we need to know the stars that we would use for the sight much bofore the actual sight. This can be done by using the star finder NP 323 and getting the picture of the available stars at the time of star of nautical twilight. From the available stars, we need to choose the best three stars. Best stars for star sight does not always mean brighter stars. Apart from the brightness, the position lines obtained from these three stars should be separated by some angle (ideally by 60 degrees). We can know this by knowing the approximate azimuth of the choosen stars from the star finder. Once we have choosen the stars for star sight, we need to measure the sextant altitude of these stars once these appear on the sky. Rest is the calculation part with which we get the position line and intercept values. Finally we need to plot these position lines on the chart to get the celestial fix of the position. Capt. Rajeev. May God bless you for all your kindness in sharing your easy to understand articles. You're the best Sir. Waiting for more articles from you. This is what i have been waiting for. Some other says this now not so important due to high technology on ships nowadays. But for me it is good also to know have a knowledge in celestial navigation. Thanks Capt!! your articles are very useful and in simple language! Thnx alott sir..ur explanation is simply superb...by reading ur blogs it helps me alot..please make a blog on topic gyrocompass n magnetic compass. these two topics are really difficult to understand. eagerly waiting sir. Vivid explanation. Im also reading your article basics of draft survey. Thank you Capt. Sir thanks for explaining sextant and it’s use and calculation in very simple language..nobody can explain better than this .. It was wonderful article, self explanatory. Can you please elaborate on why do we normally use intercept method for star sight calculation and what are the method of finding stars if star finder is unavailable onboard. Thanks in advance sir. Thanks a lot sir. What about the Run of the ship during sight interval and can we fix position with 2 observations? Sir, Can you please write a blog about procedure for calculation of noon position (startting from long by chron to mer pass) diagramatically with details about how to trabsfer run, PL etc. ? Thanks, very simple explanation for understandings. Sir I have one doubt . Why can’t get take sights of two stars . We can get a fix using 2 position lines also right ?